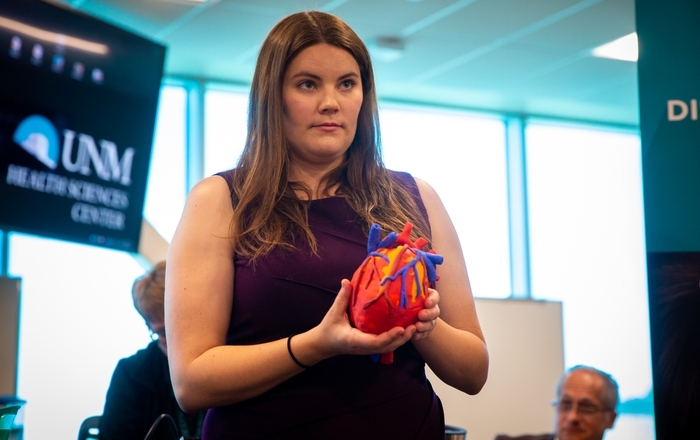 Danielle Martin holds up a “pedagogical plushie” during the inaugural Health Hackathon at the Domenici Center for Health Sciences Education on the The University of New Mexico Health Sciences Center campus. 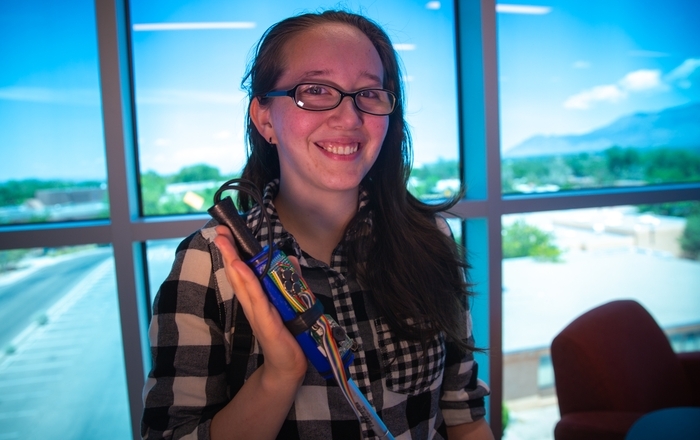 Nika Mitchell, a UNM chemical engineering student, shows off the ‘Visi Stik’, a ‘3D cane’ for the visually impaired, to judge Mathis Shinnick at the inaugural Health Hackathon at the Domenici Center for Health Sciences Education on the The University of New Mexico Health Sciences Center campus. 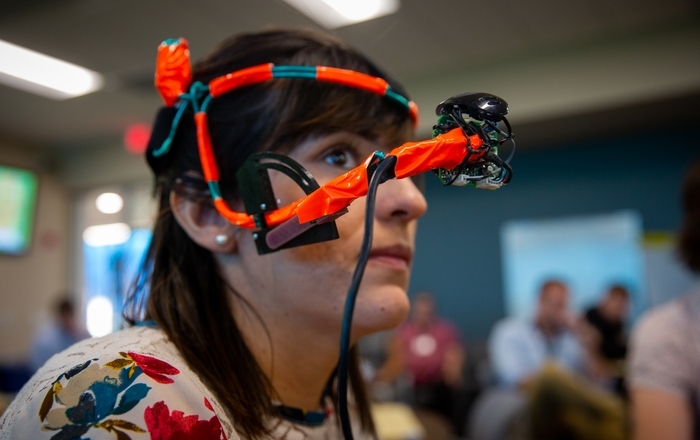 Florencia Monge, from The University of New Mexico’s School of Engineering, demonstrates a ‘digital communication assistive device’ during the inaugural UNM Hackathon. 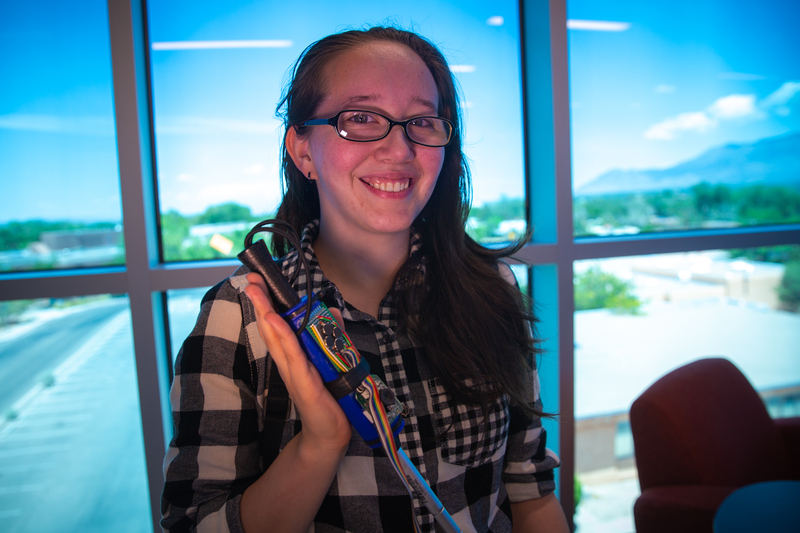 Nika Mitchell, a UNM chemical engineering student, shows off the ‘Visi Stik’, a ‘3D cane’ for the visually impaired, during the inaugural UNM Hackathon. 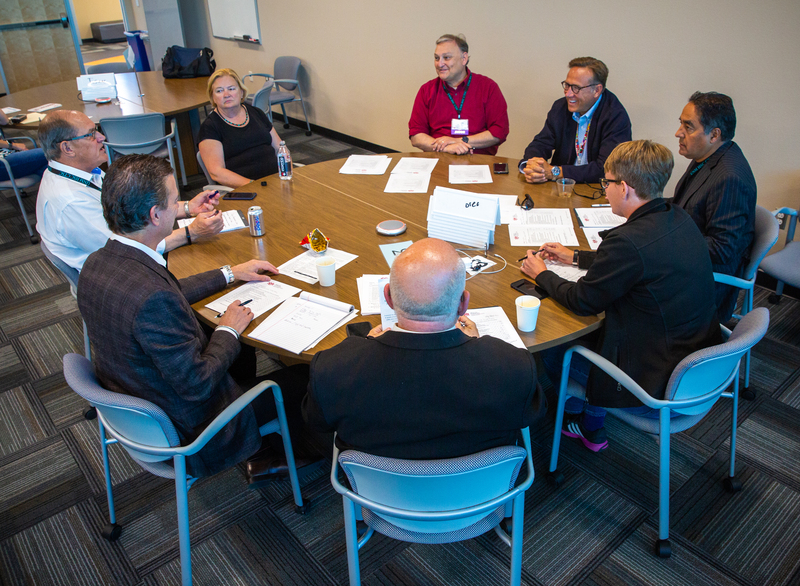 Judges deliberate who will be the winners during the inaugural UNM Hackathon at the Domenici Center for Health Sciences Education on the The University of New Mexico Health Sciences Center campus. 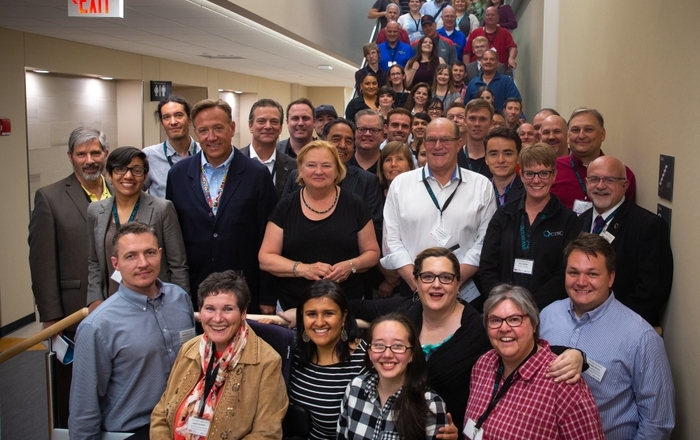 Organizers, judges and participants line up for a group photo at the Domenici Center for Health Sciences Education on The University of New Mexico Health Sciences Center campus during the inaugural Health Hackathon. 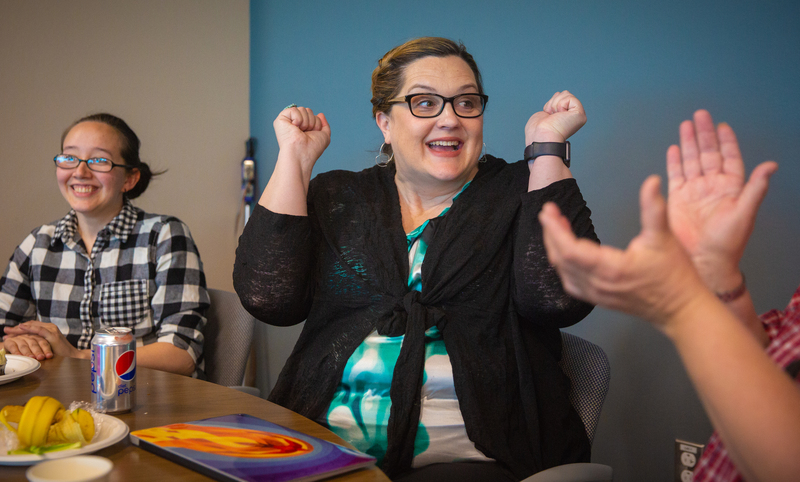 UNM Biomedical Engineering Associate Professor Heather Canavan celebrates upon finding out that her team was one of the winners of the inaugural UNM Hackathon at the Domenici Center for Health Sciences Education on The University of New Mexico Health Sciences Center campus. 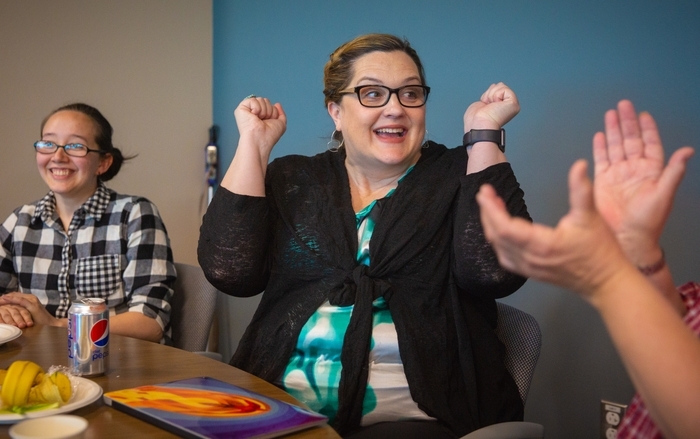 When her team was announced as a winner of The University of New Mexico’s first-ever Health Hackathon Sunday afternoon, Carla Wilhite could barely contain herself. She joined in the applause and shouts of appreciation as team leader Heather Canavan, PhD, associate professor of chemical and biological engineering, accepted a certificate symbolizing their achievement: a $10,000 pilot award from UNM’s Clinical & Translational Science Center (CTSC) for an invention called a Visi Stik. 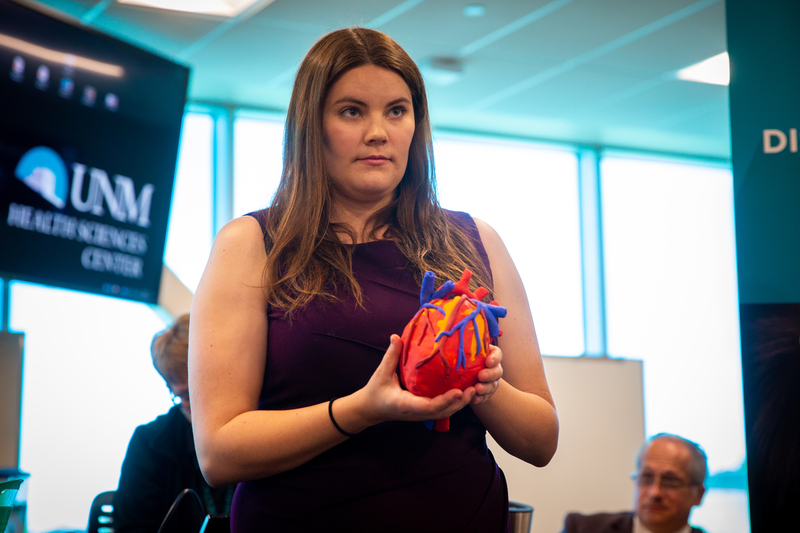 “She would rather hold the money,” kidded Wilhite, an assistant professor of pediatrics and occupational therapy, as the team arranged themselves haphazardly, smiling broadly for a group photo with the competition judges and organizers. 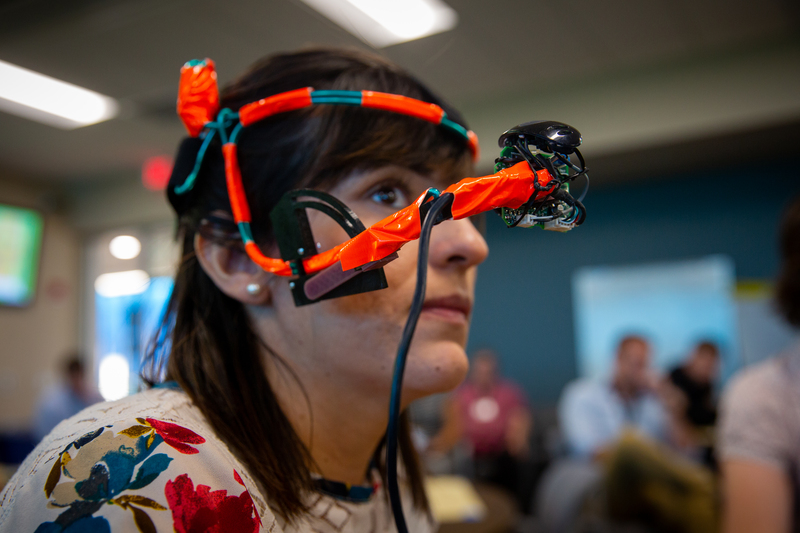 It was the culmination of an entire weekend of pitches and prototypes in pursuit of improving the health of New Mexicans that unfolded in the North Wing of the Domenici Center for Health Sciences Education on the UNM Health Sciences campus. 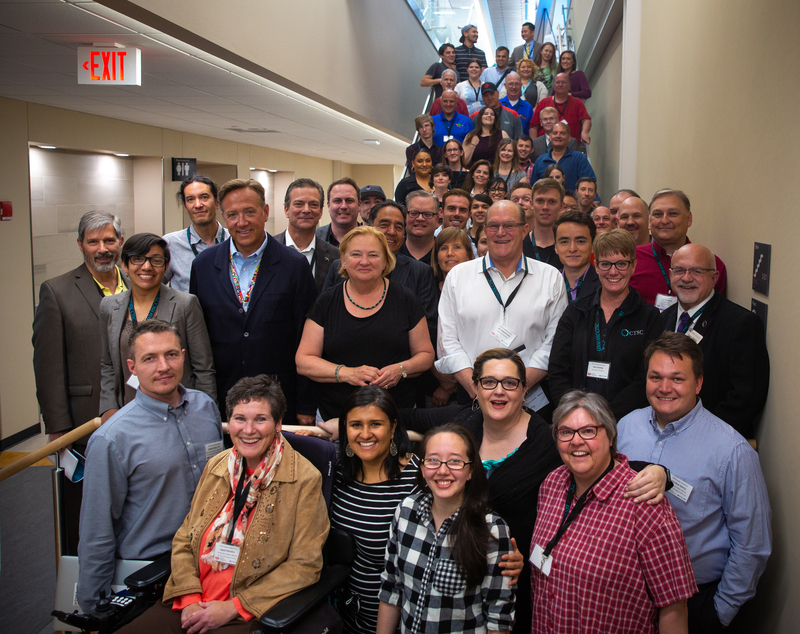 Over the course of 48 hours, more than 60 participants with varying expertise organized into teams, each focused on a single health-related idea. Using the available materials – including pipe cleaners, modeling clay, tiny computers and 3D printers – they created prototypes and honed their pitches to prove that their health solution was worth one of the two pilot awards up for grabs. 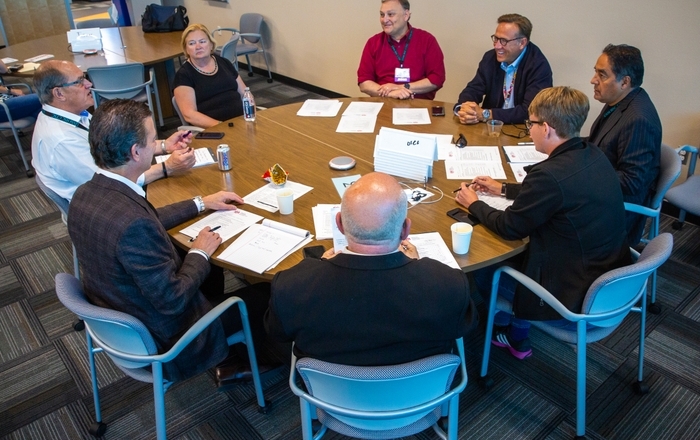 The event, nine months in the planning, started Friday evening as the hackers listened intently to Frank and Lisa J. Kuuttila, president & CEO of STC.UNM, discuss how to grow a notion into a fruitful project. "Obviously, we want to find clever, innovative solutions to problems that exist today,” said Frank, a professor in the Department of Family & Community Medicine. “That's really what we're about." The room was brimming with originality as each hacker tried to convince the other participants of their idea’s merit. 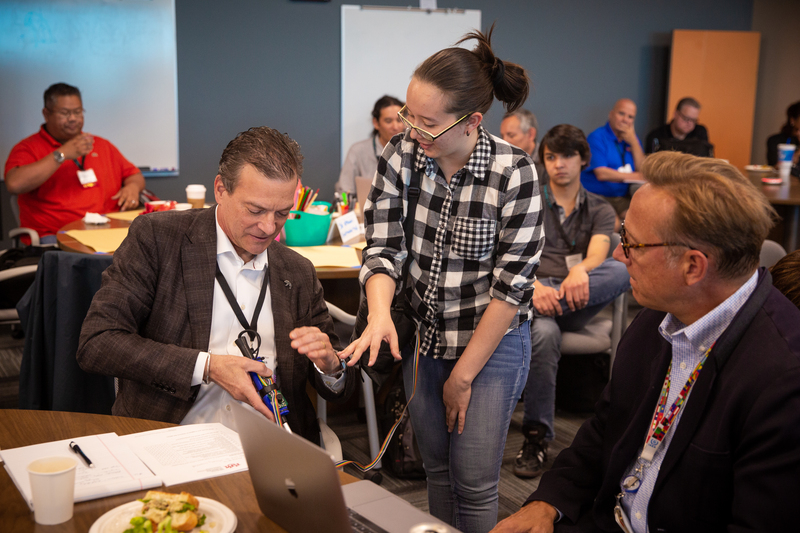 The resulting projects incorporated a range of health issues – from mobile apps that track celiac disease symptoms, to ultrasound patches, to easy access wallets for Parkinson’s disease patients. It would be a tough decision for the panel of four judges who convened Sunday afternoon to pick two winners based on the innovation, marketability and market sustainability of their ideas. Canavan’s team developed the Visi Stik, which they described as a 3D cane for people with impaired vision. "Everyone, please close your eyes,” requested Canavan during her pitch. “Without looking, is there something in this room that poses a threat to you? Something you might hit your head on that you couldn't detect, based only on what you can feel on the ground?" About 40 percent of visually impaired people who use canes sustain head injuries each month from hazards located at head level – that’s about 300,000 injuries annually in New Mexico alone, Canavan said. After surveying a sample of cane users through networking and social media, the team built what the users wanted: a low-profile sleeve that slips onto any cane and detects the environment in three dimensions. "The Visi Stik will allow users to walk at a faster pace with more confidence that head-level hazards will be detected and avoided in time," she said. On Sunday, a cane with the sleeve – made up of blue computer boards, rainbow-colored ribbon cables and miniscule cameras – was passed around the panel of judges. They clearly approved as the Visi Stik team was the first to receive an award that day. A second pilot award remained, however. Frank Jaime, MD, an associate professor of obstetric anesthesia, and his team introduced the Flex Trach, a device that prevents failed tracheal intubations by medical professionals. Of the 35 million intubations performed every year in the US, about 8.7 million are not performed correctly on the first try, according to the team. This can have severe repercussions for a patient who cannot breathe on their own, including hypoxic brain damage or cardiac trauma. Improving upon the traditional laryngoscope design, the team created what they described as a steerable endotracheal tube using a syringe that inflates a small balloon at the end of the tube. The operator can maneuver the device more easily during difficult intubations. The judges agreed, and the Flex Trach team received the weekend’s second CTSC pilot award. As they celebrated their victories, both teams attributed their success to their members’ diverse skills. "Every single person brought something different that added so much to the project and it was completely different than anything I could have come up with on my own,” Canavan said. David Grow, PhD, an associate professor of mechanical engineering at New Mexico Institute of Mining and Technology, was happy to learn from fellow Visi Stik teammates outside of his discipline. 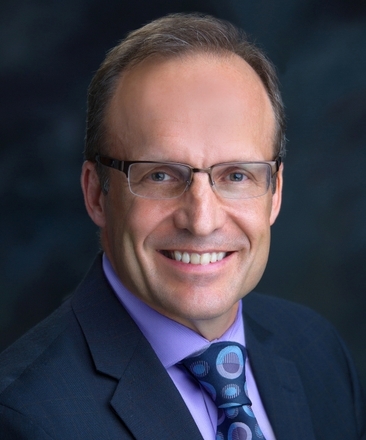 Jeffrey Norenberg, PharmD, PhD, professor and director of radiopharmaceutical sciences, said he was pleased to see how much innovation occurs on the UNM campus. "I know that there's going to be more ideas coming forward,” he said. “We're going to be able to build even stronger teams based on this experience to help us all try to hack health and make a difference in the lives of New Mexicans and beyond."